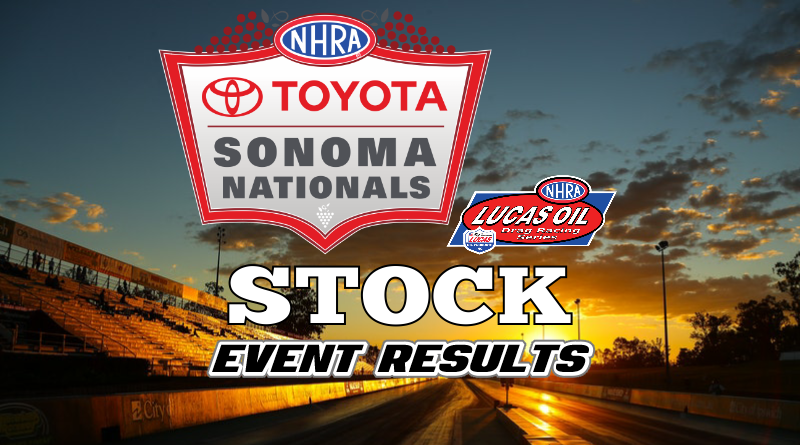 SONOMA, Calif. – The 2018 Toyota Sonoma Nationals Stock Eliminator winner was Leo Glasbrenner. The Chino, Calif. racer drove his ’68 Pontiac Firebird to his seventh national event win after defeating current number two in the world and perennial top-ten player Jody Lang in the final round. Glasbrenner’s path to the win included a murderer’s row of talented drivers including recent Mile-High Nationals winner Drew Skillman, reigning Stock and Super Stock world champion Justin Lamb, Doug Lambeck, Randi Lyn Shipp, and finally Jody Lang. I don’t believe you could find a tougher set of opponents in Stock Eliminator if you tried. After taking an easy win over Roger Hall in the first round when Hall missed the tree and ran off his dial, Glasbrenner met up with Drew Skillman in the second round. Glasbrenner’s .009 reaction (his best of eliminations) lead the .040 reaction of Skillman. At the finish line, both drivers killed about a hundredth to go dead on their respective dial-ins. Glasbrenner’s dead on with a two beat Skillman’s dead on with a nine in a close race. Glasbrenner dodged a huge bullet in his third round encounter with world champ Justin Lamb. Glasbrenner had his worst reaction time of the weekend, a .074, but survived the round when the Champ went -.006 red. Editor’s note, earlier in the weekend Justin had pulled off two perfect, .000, reaction times. Round four Glasbrenner survived another tough race with multi-time national event champion Doug Lambeck. Lambeck tagged the tree with a .009 reaction to Leo’s .018. As the cars moved down track, Lambeck’s hot rod began to slow eventually running .012 above. Glasbrenner eased off the gas to take the easy win. Red hot Randi Lyn Shipp proved to be a handful in the semifinal round. Having already been in multiple final rounds this year, Shipp laid down a great pass to challenge Glasbrenner. In almost a heads up race, both drivers left with .02 reaction times and both made all-out passes. Shipp took the finish by .001 (about 2 inches) to break out by .006. Glasbrenner collected the double break-out win by running -.003 under his dial. What a super close race by two talented Stock racers. Jody Lang of Puyallup, Washington made it to the 54th final round of his talented career. Lang runs one of the slower cars in the class but consistently finds win lights. Currently number two in the national standings, Jody will be a player in the national championship race later in the year. After first round opponent Karen Comstock broke and second round opponent, former world champion Brad Burton fouled by -.001, Lang cruised into a third round matchup with none other than Jeg Coughlin. Jeggy laid down a solid .034 package, .028 R.T. and dead on with a six, but it was just short as Lang laid down a .025 package himself. Lang was .016 at the tree and killed about .02 to go dead on with a nine. What was really impressive is Lang took .009 at the stripe against a car that was running 2.5 seconds quicker with a 30 mph difference in speed. Lang’s fourth round win over Jon Irving, who also reached the semifinals in Super Stock, earned him a bye run to the final. After both drivers hit .021 reactions, Lang took the win after both driver’s hit the brakes at the finish line. Irving dumped at the stripe to go .04 over but Lang caught the dump and was able to take .009 to go .036 above his dial for the win. In the final round, Lang took control at the start with a .020 to .053 reaction time advantage. At the finish line, Lang gave up the stripe, dumping to a 12.224 E.T on his 12.16 dial-in. Glasbrenner was able to scrub the brakes to kill a hundred and go dead on his dial with a five. Glasbrenner’s .058 package proved to be a winner. As for Lang, it looked as if he was on a 12.18 pass against his 12.16 dial. This would have been enough to take the win had he not chosen to give up the stripe. Glasbrenner fought his way through some of the best Stock racers in the country to add another Wally to his collection. Congratulations Leo, great job!